During 2009 the 2600 terrorist attacks resulted in the number of deaths soaring to more than 12,000 casualties in Pakistan, compared to the number killed in Iraq falling to 2,800 from the 2008 total of 5,900. The U.S. War in Afghanistan pushed the Taliban and Al-Qeeda over the border into Pakistan that has sparked an escalating insurgency and Pakistan's own U.S. backed un-popular "War on Terror" which is going just as badly as that in Afghanistan, only without the deep financial pockets to embark up on an never ending war that is increasingly sapping what little strength the Pakistan Economy had out of it and now seriously risks the collapse of the state due to the stress of the conflict on the economy and society. The world appears to be sleep walking towards a mega-crisis during 2010 and beyond resulting from that of continuing and escalating terrorist insurgency fed by U.S. policy, that is spreading like a cancer across Pakistan resulting in the disintegration of the Pakistani economy and by consequence the disintegration of many areas of the state into lawless areas despite the size of the Pakistani Army, this would result in fallout across the whole region and the wider world on a scale of several magnitudes greater than that which followed the collapse of Iraq following the 2003 invasion. Pakistan populated by more than 170 million people could turn into a black hole that could swallow many more trillions of dollars in an escalating but ultimately unwinnable war on terror that would disrupt not only the economies of the west with hundreds of thousands more boots on the ground, but also the economies of the neighbouring states, especially India, Iran and China much as the war in Afghanistan had increasingly impacted on the Pakistani state and economy over the past few years. Not only is Pakistan's vast military industrial complex and arms stock piles at risk, but far more deadly than the IED's or klashnikovs are Pakistan's nuclear and chemical weapons that could greatly increase the risks of a series of dirty bombs emerging from within a failed state even if the nuclear weapons themselves remained secure. 1. First world military technology such as drone air-craft and satellite surveillance made available to the Pakistan army to enable it to fight a more precise war against the Taliban Leadership without unpopular blanket warfare across regions of the country that only results in the conflict spreading and new recruits for the insurgency. 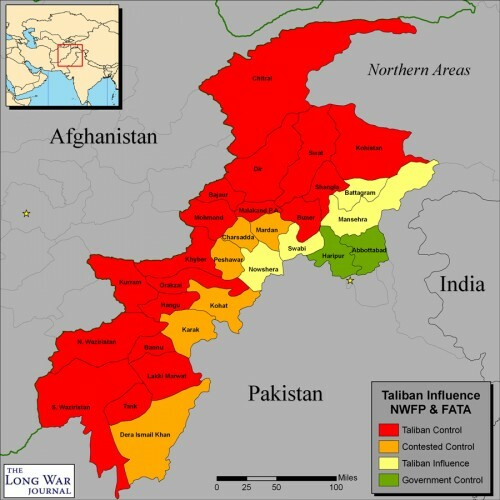 Therefore Pakistan's War Against Terror needs to be greatly de-escalated rather than escalated, basically a strategy of containment of the Taliban in the Pushtoon areas rather invite more Pushtoon's to join the Taliban as a consequence of Pakistani Army actions. This would allow the rest of a more ethnically and culturally diverse Pakistan to stabilise rather than become sucked into an ever widening conflict. 2. To financially support and reform the Pakistan Government and economy into a self sustaining secular growth machine and as a far less corrupt entity than at present, much as the United States succeeded in turning the collapsed economies of Germany and Japan around following the second world war that would seek to pull Pakistan's people out of poverty and illiteracy, especially aimed at the impoverished youth that are increasingly falling pray to the Taliban ideology of holy war. The alternative of remaining on the present path risks the already debt saddled western worlds economies sowing the seeds of a Pakistan Collapse triggered Great Depression, much as many aspects of today's economic and financial crisis have their roots in both Afghanistan and Iraq and with even far worse consequences for the neighbouring states of Iran, India, China and perhaps Russia as the conflict falls out of Pakistan's borders. However at present U.S. and Western focus is primarily focused on bombing the Taliban and Al-Qeeda from the air and enticing the Pakistani army to embark on huge military expeditions against large regions of Pakistan, therefore not learning a single lesson from either Iraq or Afghanistan that the real solution is to win hearts and minds which cannot be done through carpet bombing of towns and cities but rather through building civil society and infrastructure. Unless action is taken now to change course then we may look back at the present in a few years time and say why did we not do something when we had the chance to prevent the Great Hyper-Inflationary Depression and resulting Global War much as the 1930's Great Deflationary Depression ultimately resulted in the Second World War. American Economy set for the second leg down is in no shape to turn any other country around. In fact it will be hard pressed to prop itself up let alone fix Pakistan up. I see USA in a gambit to run Oil pipelines through Pakistan and Afghanistan that will be blown up on a daily level. While they are keeping China from getting access to oil at the moment this won't hold much longer .If the second leg down in the US economy comes this year Americans will be out in the streets rioting at the least . Should the second leg down come in the US economy Desperation will begin in America in earnest. the wars will be condemned as they should already have been,by the American people.